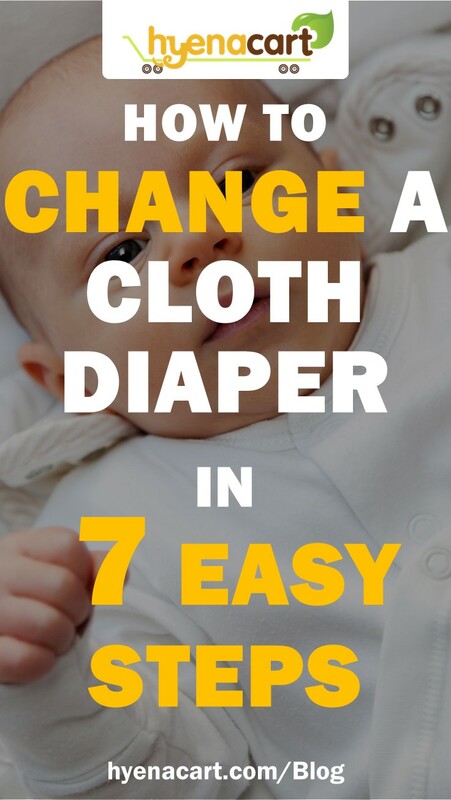 For those who are still considering cloth diapering, but haven’t taken the plunge, it can be hard to envision what the whole process will look like. Do you have to use pins? How are you going to get all those snaps fastened on a squirmy baby? How do you deal with poop? They’re all very good questions, so I thought I’d take you through the very simple diaper changing system I used with my kiddos. As mentioned before, after much experimentation, we ended up with a system of prefolds and velcro covers. For me, this was the sweet spot of affordability, effectiveness and simplicity. I would have pre-moistened cloth wipes ready to go. I’d remove the diaper and wipe up any messes as needed. 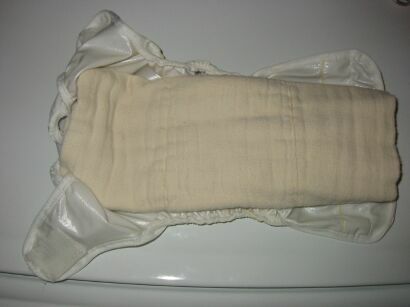 I found that having wipes sitting in a wipes warmer was impractical, so I just remembered to run a few wipes under the faucet before beginning the diaper change. Wipes and diapers that were just wet would go directly in the diaper bin, which I had set up next to the changing table. Poopy diapers would get set aside to be dealt with later. Again, like a disposable, I’d pull up the diaper and wrap between the baby’s legs, making sure it was nice and snug against the baby’s belly. You’re probably starting to see why this was my favorite system from a simplicity standpoint. At this point, I would just fasten the velcro tabs, just like ‘sposies. I’d be sure that the corners of the center portion were smoothed out so they didn’t fold back and scratch the baby’s waist. 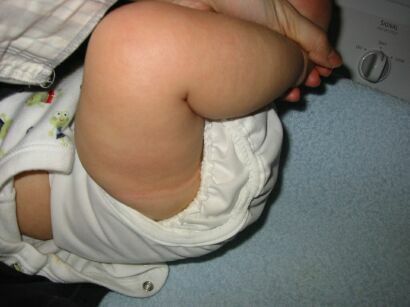 I’d do a quick check to make sure none of the diaper was hanging outside of the cover (surefire way to get leaks), and also that there were no big gaps around the legs. This is where I would release the child back into the wild and deal with the dirty diaper. 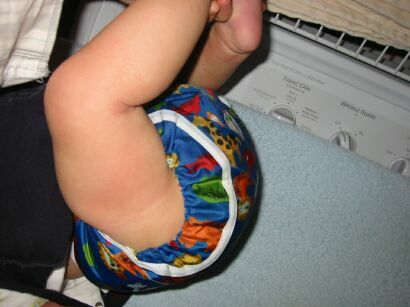 As mentioned earlier, only-wet diapers would go straight in the diaper pail. 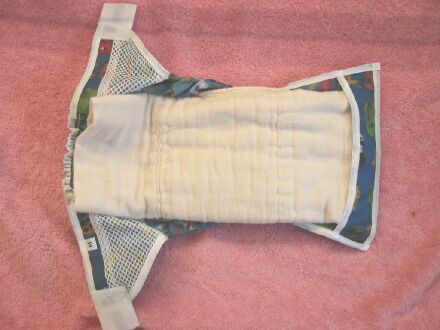 Then I’d leave the diaper cover to air out. I’d tend to re-use covers until the got pooped in or damp from pee. For kids on solids, I’d dump the BM’s into the toilet. Typically, it was easy enough to get most of it off with TP. Breastfed BM’s can go straight in the diaper pail.